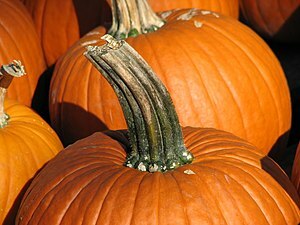 Whenever fall rolls around, I start to crave pumpkin dishes. I want pumpkin lattes, pumpkin bread, pumpkin pancakes and pumpkin pasta. 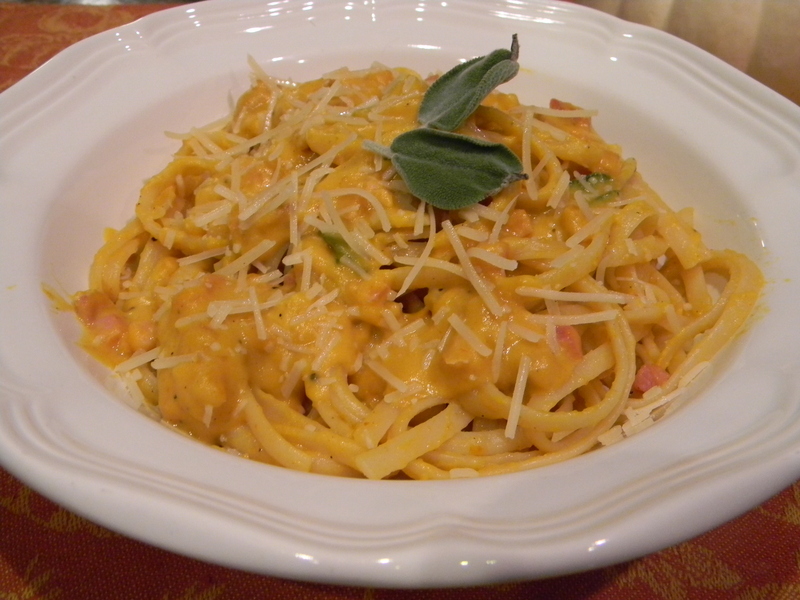 This is one of my favorite go to dinner dishes for fall and it is super fast. This dish can be made vegetarian by omitting the pancetta and adding black beans or any other vegetable of choice. Bring a pot of salted water to a boil and add pasta. Cook according to package instructions, drain and rinse. While pasta is cooking, in a large saute pan, heat 2 tablespoons olive oil over medium heat. Cook garlic for 30 seconds until fragrant, do not let it brown. Add pancetta and cook for 1 minute. Add red pepper flakes, nutmeg, cream, stock, and pumpkin. Season well with salt and pepper. Turn heat up to medium high and bring to a boil. Add fresh sage leaves. Whisk mixture until smooth for about 30 seconds to one minute. Remove from heat and pour over warm pasta. Garnish with shredded parmesan cheese and fresh sage leaves. Serve with bread and salad for a quick meal. 1.) 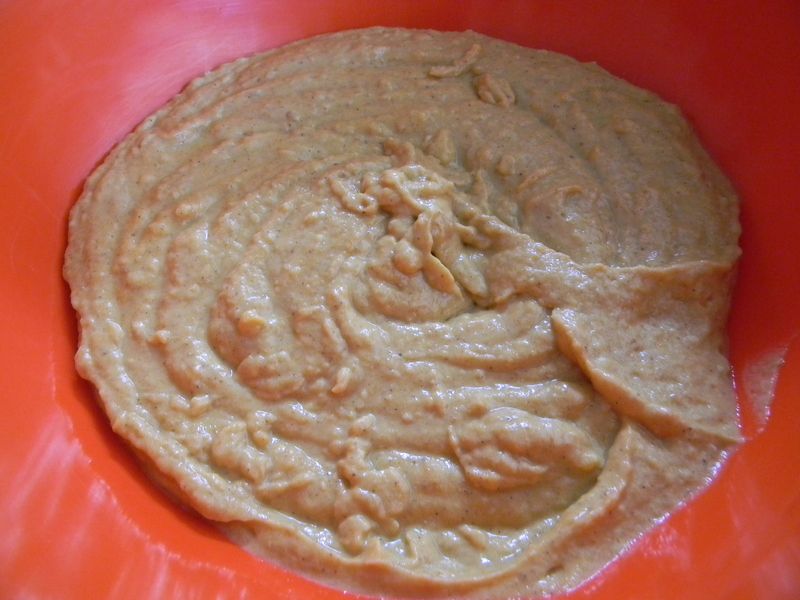 In a large mixing bowl, whisk together flour, sugar, baking powder, cinnamon, ginger, nutmeg, clove, and salt. 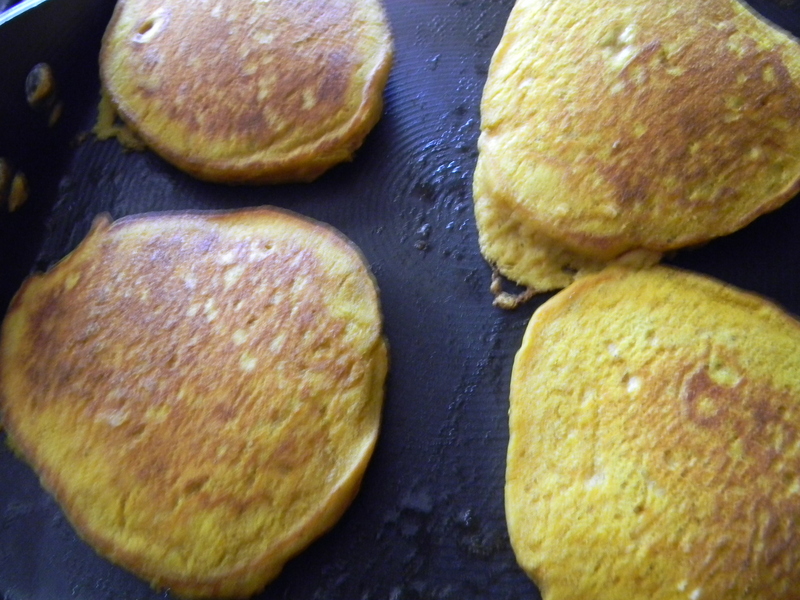 In a medium bowl, whisk together milk, pumpkin puree, 2 eggs, melted butter, and vanilla. Whisk the wet ingredients into the bowl with the dry ingredients. 2.) Heat a griddle over medium heat and coat with a little butter. 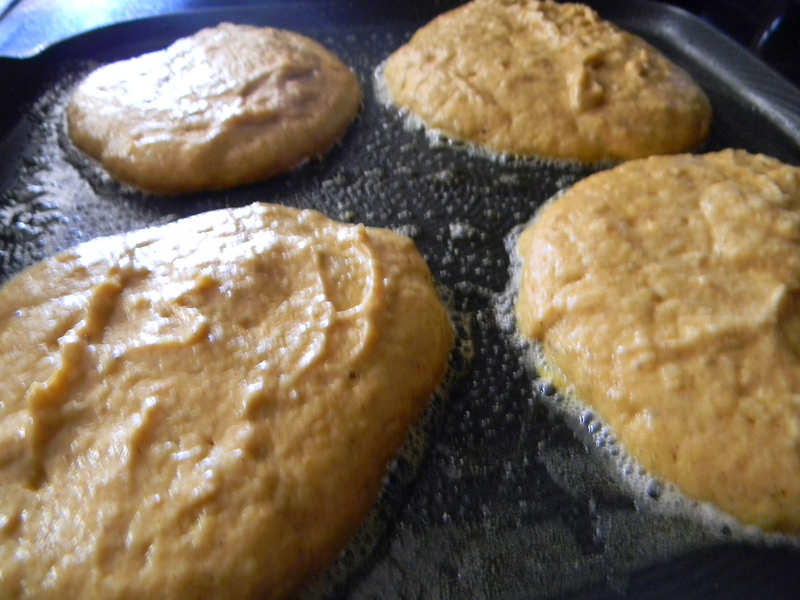 Spoon pancake mix onto griddle about 1/4 cup at a time. Cook pancakes for about 2-3 minutes per side until browned and golden. 3.) In a small saucepan, heat maple syrup over low heat with cinnamon stick and cloves for about 5 minutes until warmed. 4.) 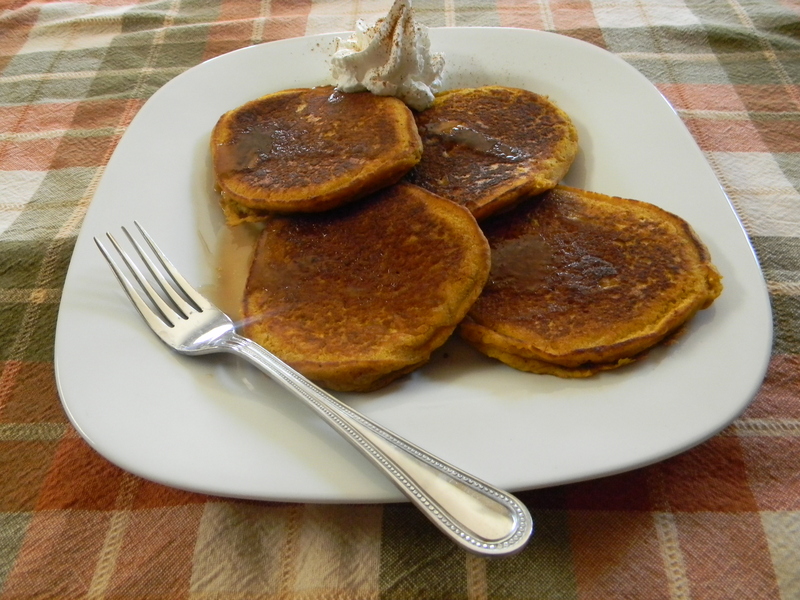 Serve pancakes with warm spiced maple syrup and whipped cream if desired. Fall is by far, my favorite time of year. Growing up in Michigan, it meant there was a chill in the air, it was time to break out the fall clothing and boots, the cider mills were open, and there was a sickly sweet smell of rotting leaves outside. Living in Arizona, fall means that the heat drops from the triple digits, store-bought cider, and breaking out the sweaters and boots to wear in the winter. I am still perplexed as to why our stores here insist on putting out their fall merchandise in August. You DO know that it is 110 outside, right??? God, what I wouldn’t do for some cider and donuts from the Franklin Cider Mill right now. I think that this year I will venture up to Flagstaff or Sedona for some fall colors. This, I admit, is the best part of living in the desert. I can drive a short distance to see the leaves change color without having to do any fall cleanup in my yard. Weekends consumed with bagging insanely huge piles of leaves or digging them out of gutters was not my idea of a good time. Fall also brings football season, which means around 30 plus hours of games running on my living room television per week by my husband. I have pretty much been a football season widow since my husbands playing days anyway, except now there are no training camps for weeks on end in the summers. I am good for about 4 hours of football viewing per week, then it all looks the exact same (I know, shame on me for marrying a football player). 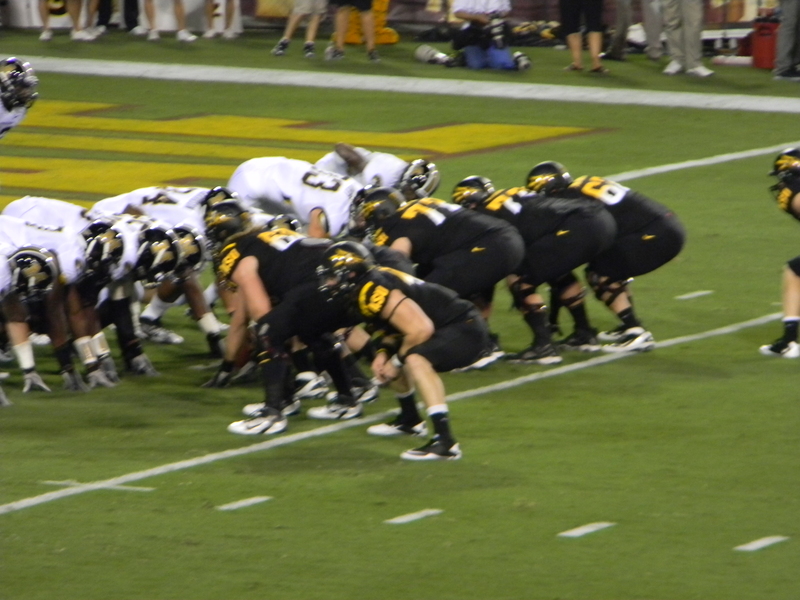 Don’t get me wrong, I love a great football game, only if it is a team I care about (ASU’s Sun Devils or a Cardinals game in person). My husband obviously does not get my lack of enthusiasm for football. In fact, when we went to the Superbowl here in Arizona, I was disappointed that it was just another football game and couldn’t see the commercials on television. Only I would do this. Although, I did enjoy Tom Petty. In the kitchen, I think of apples, pies, root vegetables, caramel, corn, pumpkins, leafy vegetables, and warm dishes like soups, stews, and roasts. I am looking forward to most of the Arizona farmers markets opening and their fresh, vibrant produce. More importantly, I can’t wait to test out my camera on all the great products. Every year I try to dream up some fun Halloween menu for our son Cristian. 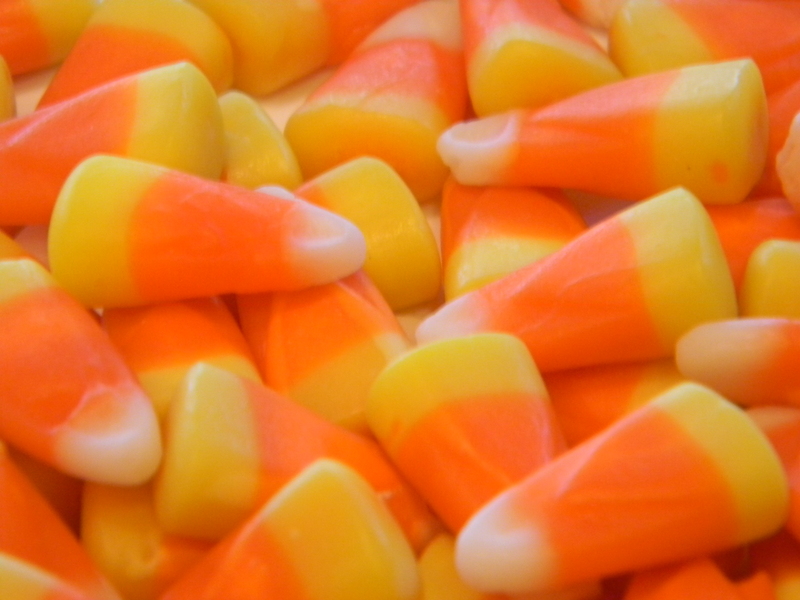 Last year was Devilish Drumsticks, Monstrous Mashed Potatoes and Ghoulish Gravy. The year prior to that was Boosghetti and Vampire Toast. I tend to overcompensate for the fact that fall is different here for us. 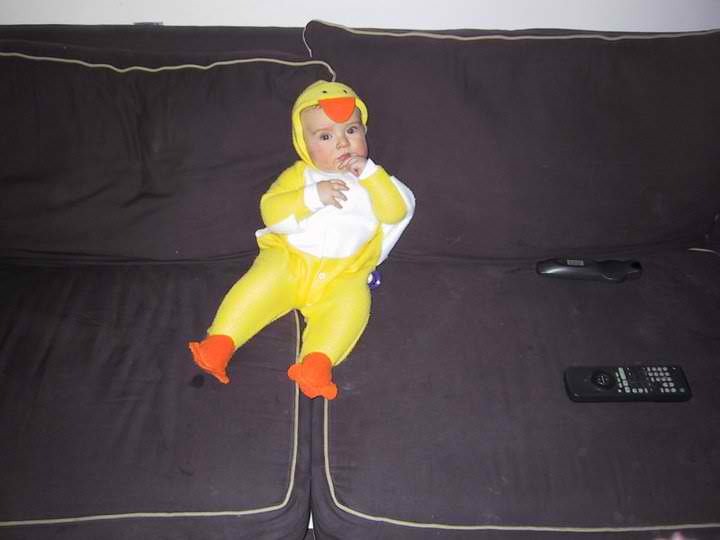 I pine over possible Halloween costumes beginning in September. In fact, I may have my Halloween decorations up this coming week. The way I see it, Christmas junkies have all their decorations out in November. This gives me anxiety simply because I am a huge Christmas procrastinator. I love the holiday however, hate having to stress out about hanging lights, getting all the decorations out of the garage, picking out the perfect present for the 50 people you have to buy for all of a sudden including teachers, bus drivers, mailmen, nail technicians, hair stylists, family, friends, and whoever else you know. Christmas is just getting way out of hand. Back to my point. Why can’t I put my Halloween decor up in September? Same thing. Afterall, Target and every other store on the planet have already stocked their Halloween shelves with creepy treats and such. Follow Jen's Fresh and Fabulous! All photos and recipes are mine and copyrighted. These images or recipes may not be used without my prior written consent. Thank you.